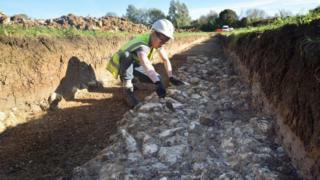 A medieval stone causeway has been discovered underneath a field in Oxford during excavations ahead of a flood alleviation scheme. The Environment Agency's £120m project aims to reduce the risk of flooding to homes and businesses in the city. Oxford Archaeology has spent three months evaluating the city's floodplain. It also found evidence of Bronze and Iron Age settlements and stone flints from hunter-gatherers. The causeway, uncovered in a field near Willow Walk, is made of rounded river pebbles, limestone and chalk rocks. Some of the stones appear to be marked with ruts made by cartwheels. Horseshoes were found among the cobbles and will be analysed by X-ray to determine their age. Ben Ford, project manager for Oxford Archaeology, said: "We have uncovered evidence for use of the landscape spanning three very different time periods. "From the Mesolithic, when we roamed the land in search of our food and made tools from stone; from the Bronze and Iron Ages, when we had established settlements and were competent crop and animal farmers; and from medieval times, when the emphasis was on trade and commerce. "This gives us an unprecedented insight into the history of this part of the Oxford floodplain." Evidence of several roundhouses - small circular houses with thatched roofs - alongside pottery and animal bones, was also found. "They indicate that there has been a settlement at South Hinksey from the Bronze Age through into the Iron Age - we didn't know that before," Mr Ford said. Catherine Grindey, senior archaeologist for the Environment Agency, called the area a "blank canvas". "There has been so little archaeology done in this area previously," she said. The Environment Agency said any impact of the flood scheme on ancient remains would be minimised.